Open-loop recycling systems, whether processing post-industrial or post-consumer plastic waste, require multiple types of automated equipment technologies working together to achieve the desired result. These can include, but are not limited to: sorting, size reduction, separation, washing, baling, and pelletizing. Each plastic recycling process is different depending on the type of plastic to be processed. Sorting machines need to quickly determine and classify huge quantities of post-consumer and/or post-industrial plastics, under constant feedback. Advanced automated plastic sorting equipment can be equipped with sensors, ejectors, computer systems and user interfaces for maximum efficiency. As a plastic recycling machine manufacturer, Vecoplan offers a comprehensive range of plastic size reduction solutions for waste plastic recycling machine facilities. 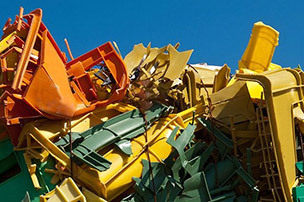 The plastic recycle machines include VAZ shredders for general heterogeneous scrap, VTH shredders for lineal scrap, FF series shredders for film and fiber, XL shredders for large bulky material, “Shorty” shredders for installations requiring a small footprint, and VNZ dual shaft shredders for initial size reduction of large volumes of oversized plastic waste. 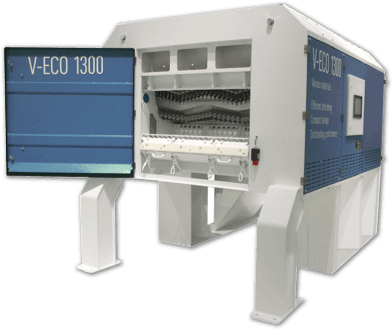 Vecoplan also offers plastic granulators and stack systems that incorporate both shredders and granulators. 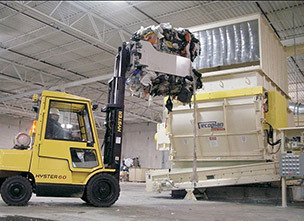 Separating equipment reduces the possibility of stock contamination and removes any non-reusable materials. The two types of processes are called dry or wet methods. The wet method use a float tank that separates the plastic materials based on density. The dry method employs air separation technologies that separate material types by density. Metals are also separated. Ferrous metals are removed through the use of magnets and nonferrous metals are removed through the use of eddy-current separators. The cleaning and washing stage removes residual dirt and residue, such as glue, paper, grit and sand. Plastic waste materials can go through a bath, friction washer or washing line, that applies a continuous hot spray along with detergents and disinfecting products for cleansing. Pelletizing is the final step in the plastic recycling process. The pelletizing machine generally uses a single or double screw extruder with different ratios depending on the desired result. The single screw extruder uses a pumping action while the double screw uses a mixing function to create the shape of the plastic for final use. Whether you need simple, closed-loop, plastics recycling machine equipment or a complex system for recycling plastics, Vecoplan has the technologies, industrial recyclers, and the right plastic recycling equipment prices. Most importantly, the experience to meet those needs and reduce plastic recycling machine cost.